by Timothy Zick. New York: Cambridge University Press, 2014. 454pp. Hardback $115.00. ISBN: 9781107012325. Reviewed by John Blakeman, Department of Political Science, University of Wisconsin-Stevens Point. The rights protected by the First Amendment to the U.S. Constitution are generally considered to be some of the most fundamental enshrined in the Bill of Rights. The freedoms of speech and press and religious liberty are not unique to the United States, but the interpretation of the First Amendment by judges and policymakers historically casts those liberties within the context of a free marketplace of ideas bounded by American history, political development, and the national borders of the U.S. Yet, globalization and the internet have brought into sharp relief how those values transcend borders too. For instance, when Pastor Terry Jones in Florida burned a Koran, the video of it “went viral” and offended Muslims outside of the United States and raised questions about the extent to which, if any, expression can be banned when the harm it causes is felt outside of the country. When the Swiss philosopher Tariq Ramadan was denied a visa to enter the United States because the government determined that he espoused terrorism, questions were raised about the extent to which an entry visa can be denied to a foreign scholar because of his or her ideological beliefs. And the ongoing controversies over Julian Assange’s publication of national secrets on WikiLeaks and Edward Snowden’s similar conduct raise questions about the status of freedom of the press in the age of digital communication that spans national borders. All of the above examples (along with many others) are discussed in Professor Timothy Zick’s book THE COSMOPOLITAN FIRST AMENDMENT. Zick’s work illustrates that the First Amendment exists in a free marketplace of ideas that is now as global as it is local, and he provides a detailed and wide ranging look at conflicts over freedom of speech and religion that transcend the borders of the United States. To be sure, Zick notes that the geographic scope or domain of the free speech and religious liberty clauses is rarely addressed by scholars, and existing case law is unclear about the extent to which the clauses apply outside of the United States. To address the dearth of scholarship, Zick puts forward a cosmopolitan approach to the First Amendment that views speech and religious liberty within a global marketplace of ideas and global religious pluralism – a view of the amendment “that is responsive to the challenges of an increasingly globalized world and liberating to an increasingly digitized and mobile citizenry” (p.20). To set the stage for his inquiry Zick uses chapter one to describe the “non-domestic dimension” of the First Amendment and defines two primary points to consider. The first concerns the [*408] extent to which the amendment “applies to and protects the cross-border flow of persons, information, and ideas,” and the second focuses on how constitutional standards concerning free speech, press, and religion are transmitted and shared across national borders (p.28). Examples of the First Amendment implications for the flow of persons, information, and ideas include whether the government can revoke a citizen’s passport because of the holder’s political ideology or associations, or deny an entry visa to an alien for the same reasons, such as with Tariq Ramadan. To do so interferes with the international flow of persons in ways that inhibit the free flow and exchange of information. For Zick, limiting both the flow of people and information constrains “cross-border exchanges and collaborations,” and thus affects “cross-border associative rights” too – the rights of individuals to associate with others and belong to groups outside of their country (p.35). Next, Zick addresses some of the issues concerning how the First Amendment may be affected by the sharing of free speech and religious liberty values across national borders. For instance, the right to freedom of the press is affected when foreign litigants seek to have libel judgments from foreign jurisdictions enforced in courts in the United States, and another example highlights how religious liberty might be affected by the importation of foreign religious laws (specifically Shari’a Law) or even foreign aid that flows from the U.S. government to religious institutions abroad. Chapter two adds theoretical depth to the issues highlighted by Zick in chapter one. Here he juxtaposes two different perspectives on the First Amendment. One approach, the provincial perspective, views the amendment as “limited in terms of geographic range or scope, somewhat insular in terms of outlook and biases, and strongly exceptionalist” (p.62). In contrast to the limited, provincial perspective, the cosmopolitan approach views “transborder conversation and commingling as central First Amendment activities and concerns with global implications” (p.77). By “conversation” Zick means the sending of information, in all its various forms across national borders, and “commingling” means the “wide variety of interactions and associations across and beyond borders” that comes through familial, expressive, commercial, spiritual, and other forms of contact (p.83). In his analysis the First Amendment’s principles were “a product of international engagement and comparison” since many of the framers of the Constitution and early judges and legal commentators studied foreign thinkers and political systems and derived those principles from their comparative studies (p.81). Zick argues that this cosmopolitan approach to the First Amendment is deeply ingrained in our nation’s history and constitutional development and also motivates the United States’ historical support for global democratization. To be sure, Zick does not advocate for an imperial policymaking by which the U.S. government seeks to aggressively export First Amendment values to other countries, and instead argues for a more modest recognition on the part of judges, policymakers, and others that the freedoms of expression and religion enshrined in the amendment transcend borders. Chapters three, four, and five analyze specific issues concerning the [*409] cosmopolitan approach to the First Amendment. Chapter three addresses the links between the foreign travel and freedom of expression, and defines “substantive First Amendment justifications for recognizing a right to engage in foreign travel” (p.110). Concomitant with a right to travel abroad is a right of aliens to be admitted into the United States regardless of their ideological beliefs or their lawful expressive activities in foreign countries. Chapter four concerns the sharing of information and membership in associations across national boundaries, and here Zick points out that a right to receive information from foreign sources or to send communications abroad has never been clearly established in American constitutional law, although U.S. citizens do have a limited right to associate with other individuals outside of the United States. He advocates for “granting robust First Amendment protection to cross-border expressive activities, including speech and association,” although those protections will have to be weighed against national security and foreign affairs concerns (p.134). A cosmopolitan approach to free speech “counsels that the United States should develop policies that facilitate global interconnectivity and information flow,” meaning that policymakers should “further ease U.S. laws and regulations restricting cross-border exchange,” and continue to cooperate with other governments to ensure the free flow of information across national borders (p.156). In chapter five Zick turns to global expressive activities that tend to be insulting, offensive, and even incite others to violence. In the digital era information travels quickly and often with little restraint across national borders, and thus reactions to expressive activity in one part of the world can often occur quickly, even instantaneously, in another part of the world. The quickness and ease with which information can spread globally also raise questions concerning expression that aids the enemies of the United States, such as propaganda or even treasonous expression that undermines the government. Zick suggests that current First Amendment doctrine that proscribes expression that directly incites others to violence yet offers exceptional protection for offensive speech need not change much to meet the global exigencies of speech and expression. Indeed, a cosmopolitan view of free speech can generally retain current constitutional doctrine and offer an educative function to “the global theater,” and existing First Amendment values “can teach the world about things such as tolerance, transparency, and self-governance.” With regard to offensive and insulting expression, one central value that the First Amendment teaches is respect for pluralism, which is “critically important in an emerging global space where forbearance, tolerance, and respect for a diversity of speech laws and cultures will be necessary to preserve global peace” (p.179). In two subsequent chapters the book discuss the extent to which U.S. citizens and aliens retain First Amendment rights outside of the United States’ territory, and the transborder dimension of the religious liberty clauses. In the example of U.S. subjects abroad, Zick does not promote a universal application of freedom of expression but instead presents an argument for its “portability.” Thus, the U.S. government must respect [*410] its citizens First Amendment rights “regardless of geographic location,” and where the U.S. government “demands obedience from aliens to its own laws, it ought to extend First Amendment protections to them” (pp.199-200). Zick notes that any extraterritorial enforcement of those rights will in many instances raise “insurmountable limitations,” yet an expansive view of freedom of expression recognizes the increasingly global dimensions of communication. In the following chapter Zick devotes some attention to transborder religious liberty and establishes a parallel with freedom of expression. Thus, the U.S. government has an obligation to facilitate and protect the free exercise of religion by its citizens regardless of their geographical location, and it should not discriminate against aliens under its jurisdiction on religious grounds either. The last third of the book, chapters 8 through 10, provides a focused look at how First Amendment values affect diplomacy, transnational legal issues concerning free expression, and U.S. policies on exporting freedom of expression to other countries. Zick discusses how the First Amendment can play a useful role in international forums broadly construed, including activities such as government-to-government interaction, public diplomacy, and the distribution of U.S. propaganda. The national government has historically spoken on behalf of the United States in international politics, and the “one voice” or “sole organ theory” of the Constitution’s foreign affairs powers, as interpreted by the Supreme Court, grants almost exclusive authority over foreign affairs to the federal government. A cosmopolitan approach to the First Amendment would temper the government’s power, however, and Zick makes a compelling argument that subnational governments and private speakers should be allowed “to participate in more open and dynamic conversations” in international forums in addition to the national government. Thus, even if the values of the First Amendment are not always applicable in international relations, they can still “inform and guide the exercise of power there” (p.266). Zick is not arguing for a wholesale reversal of constitutional doctrine that gives the national government an exclusive voice, but only for, among other things, a more inclusive sphere of free speech that includes state and local governments and non-governmental actors too. As regards transnational legal issues Zick highlights how American courts and policymakers are increasingly being asked to recognize foreign court judgments (such as libel awards), transnational legal sources on freedom of expression or religious liberty, and even foreign judgments based in part on religion. Courts and policymakers have typically adopted a provincial response to such claims and have favored First Amendment exceptionalism over the intrusion of foreign free speech and religious liberty values. However, for Zick, a cosmopolitan approach “makes room for dialogue and recognition” of other freedom of expression values, and “in its encounters with foreign liberty models and foreign liberty belief systems, the United States ought to focus on norms of comity and educational benefits associated with respectful engagement with transnational legal sources” (p.304). Thus, the U.S. should not necessarily import foreign principles [*411] but should instead seek to preserve its own core First Amendment principles through a cosmopolitan “conversation and commingling” among nation-states (p.304). 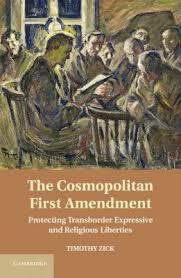 In all, THE COSMOPOLITAN FIRST AMENDMENT makes a good argument for reading and understanding the First Amendment in the context of an increasingly globalized and digitized world in which domestic constitutional rights and liberties seem to span national borders. The book presents a theoretical argument with appropriate “real world” applications. Scholars and teachers from many different disciplines will find something of value in the book. For example, students of foreign policy and international relations will appreciate the coverage of U.S. foreign policy as regards freedom of expression and religious liberty, and will also find value in the discussion of free speech in the global market place of ideas in which, among many things, expressive activity that occurs in one country can cause dire consequences in another. Those who study human rights might find Zick’s focus on making the First Amendment “cosmopolitan” a valuable complement to an international human rights approach that views free speech through more universal or global norms. Even scholars of federalism will find the book’s discussion of the “one voice” doctrine in American foreign affairs interesting, as the author suggests a cosmopolitan First Amendment may well cause policymakers to rethink the exclusive role that the federal government maintains over foreign affairs. The book is a good addition to a library’s holdings on constitutional law, international law, human rights, and foreign affairs. It is appropriate for graduate and advanced undergraduate courses on constitutional law, comparative constitutional law, international law, human rights, and perhaps courses on international relations theory. Copyright 2014 by the Author, John Blakeman.